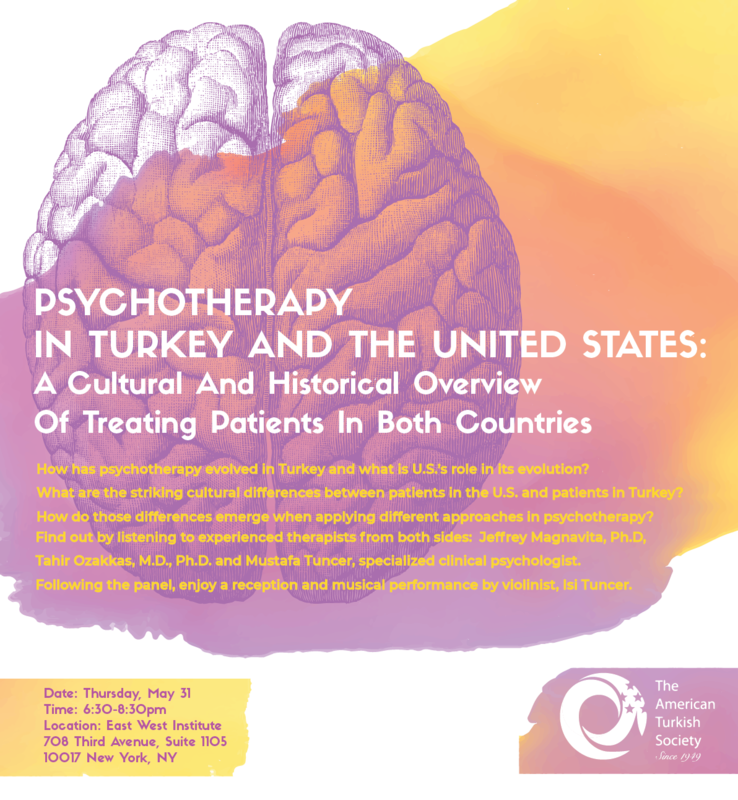 On Thursday, May 31, 2018, The American Turkish Society organized a panel titled, Psychotherapy in Turkey and The United States. The event was hosted by The Society’s board member, William J. Parker, at the EastWest Institute in Manhattan. We were thrilled to have Tahir Ozakkas, M.D., Ph.D., Mustafa Tuncer, specialized clinical psychologist and Jeffrey Magnavita, Ph.D. as speakers and Goksin Ozkarahan, M.D. as our moderator. During the panel, participants gained valuable information about how psychotherapy evolved in Turkey and U.S's role in its evolution. Mustafa talked about what the striking cultural differences were in treating patients with personality disorders in both countries. Tahir took us back in history by explaining how he founded the Psychotherapy Institute in Istanbul with the help and support of many important American psychotherapists. Following the panel, participants enjoyed a reception prepared by Sipsak restaurant and a musical performance by Mustafa Tuncer’s daughter, violinist, İlke Işı Tuncer.